I’m sure all the various merrymakers are going to disappointed that they cannot go back and “First” all the posts for the last half-dozen or so years. Crap. I took the time to hit the forums. Comments are back! Yay Philip! Thanks for all your work. Let’s hope this stays civil. 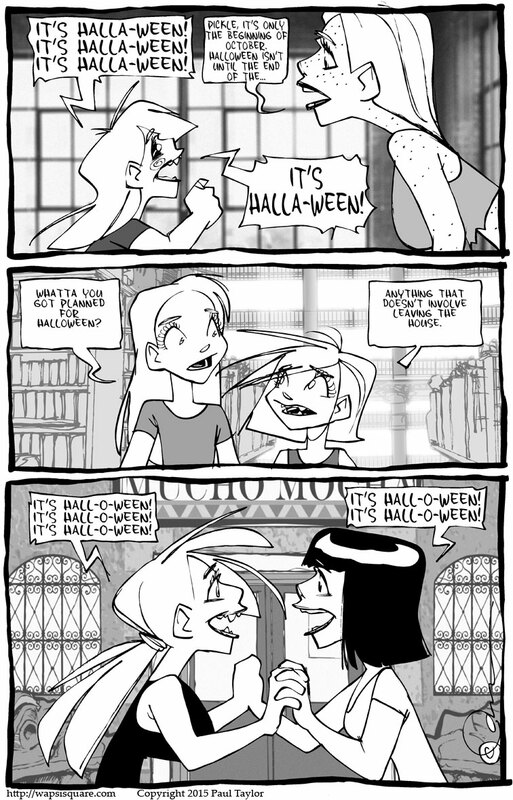 On topic, Hallowe’en is my favorite holiday! What? Comments are back? Cool, I finally get to make a comment on a Wapsi Page. I didn’t find the comic early enough to do so before they were shut down. Where’s the link to Paul’s eBay store? Oh – it’s one of the yellow links you can’t see against the white background at the bottom. What i was seeing was a white strip at the very bottom with yellow text for the links. Now i see the old links, with the old graphics, in their usual places. Still a little borked, but comments are back. I guess I prefer the forums, myself, but that’s me. People who post in comment sections like this are–in general and in aggregate–a lot more likely to be *cough* casual about what they do or don’t say here. The Comment section makes it a lot easier for anyone with a Gravitar to type in whatever they feel in the moment and move on without giving what they said a second thought–which is good if the site-owner just wants to see what the general feeling is about any given installment. However, people who are a bit more invested, like those who go to all the trouble to sign up for a Forum Account, will generally be a little more considered and reflective about the day’s comic, and will also be a bit more courteous and respectful for the most part. IIRC, the Comment section was shut down the first time because people would drop in, bluntly say whatever was on their mind, and not treat the author or the audience with any real courtesy. It will be interesting to see if the pattern repeats itself, a half-decade-plus later. I just wanted to say what a wonderful, whimsical, and very amusing story this whole comic strip has been. And I’ve wanted to say that for years…………….. Thank you. Ed. I can haz comment? My goodness! If this storyline doesn’t reference the Helloween song at least once, I’ll be very disappointed. No, see below. I put up a link to it. I linked that on in the forum. Dr Stein would be another good song to reference. Yeeeeah comments are back!!! I just went through and reread most of Wapsi from the beginning….can’t believe I’ve been reading it so long! Keep it up! Let the games begin! Welcome Back, Komments! I just noticed that Devyn and wossname seem to be in the Library. Ugh I’m glad I can comment, I had to go through two years of comics before I could refind the comment section. Oof I’m late all the comments were from three years ago. I feel old.